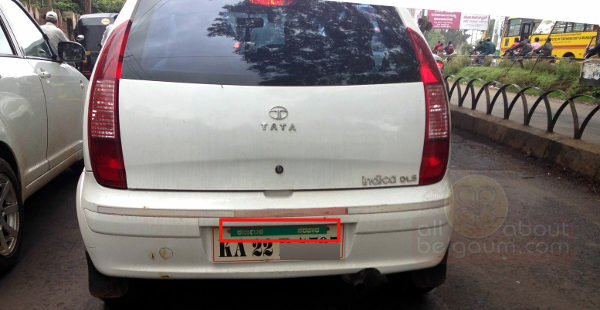 Several vehicles hired by government departments displayed Government of India/Government of Karnataka boards on top of the number plates. This is illegal and in Benagluru the RTO has issued notices and even fined a few vehicles for having ‘Government of Karnataka’ written on the number plates. Cases can be booked against such vehicles for having defective number plates and under other provisions of the Central Motor Vehicles rules,50&51. As per CMV rules 50 & 51 number plate should be as per the law. There is a prescribed sized for class vehicles. All number plates should be written in two lines compulsorily for two wheelers. No design or any wordings should be written on number plate. No stickering on number plate is allowed. According to rules, every two wheeler and three-wheeler must have a number plate of 200×100 mm size. The light motor vehicles such as cars have to have 340×200 mm and heavy commercial vehicles 340×200 mm plates. the rectangular number plate must be written in English in the front and rear of a vehicle. Mopeds and bikes of less than 70cc should flash front alphabets of 15mm height and numerals of 2.5mm width with 2.5mm space. The size of letters of rear number plates should be 35mm high and the numbers 7mm wide with 5mm space. At times, chain snatchers and robbers use two-wheelers with fancy number plates. It helps them escape from the spot before anyone can read the number of the vehicle. So will the authorities in Belagavi also act in such illegal number plates? I have seen number plates in languages other than English, which is difficult to read if that vehicle is involved in any crime or accident. I have seen two-wheelers and four-wheelers without number plate. How can Belgaum RTO even allow this. In Belgaum there will be people riding more than allowed pillion on two-wheelers, riding/driving on the wrong side of the road, talking on the mobile while riding/driving. Belgaum RTO has to be strict.